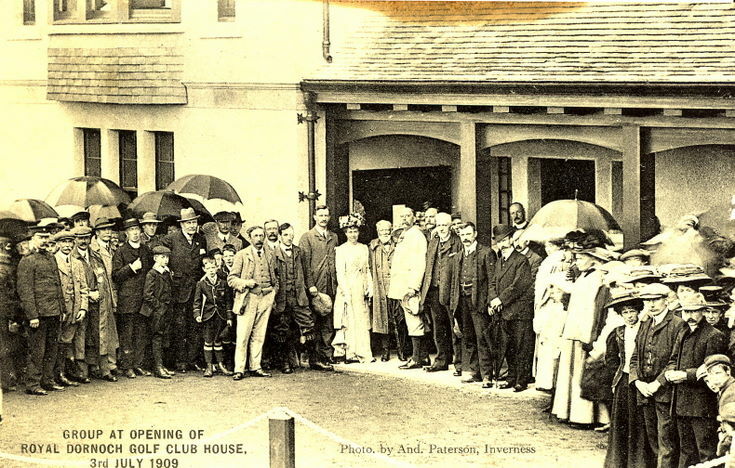 Postcard of group at the opening of the Royal Dornoch Golf Club House July 3rd 1909. Postmarked 1913 or 1915. Original addressee and message scribbled out in biro. I am sure the man in the foreground of the photo, left hand in trouser pocket and wearing white trousers, is John Sutherland, the secretary of the Royal Dornoch Golf Club. I am wondering if the man beside him, wearing a bow-tie, is Walter Matheson (who would be one of the winners of the Northern Counties Cup Quartette in 1911). See picture #255. Three other persons I think are identifiable are (in the centre of the photo) Mrs Carnegie, her husband beside her Andrew Carnegie and beside him (to the right) is the club captain A.J. Ryle. See photo No: 252. - Thank you for your comment. Administrator.